IIE is a world leader in educational relations in 175 nations. Founded in 1919 and managing over 250 programs promoting academic advancement and exchange, IIE has varied online needs. The Fulbright Foreign Student Program is the large exchange program offering opportunities for students and young professionals to undertake international graduate study, advanced research, university teaching, and primary and secondary school teaching worldwide. The program currently awards approximately 1,900 grants annually in all fields of study, and operates in more than 155 countries worldwide. 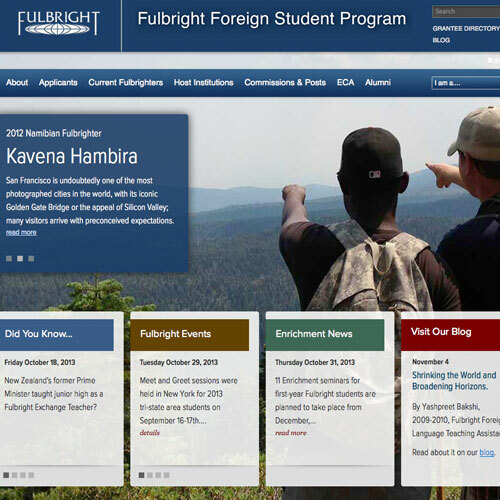 While most programs had an established online presence, the Foreign Fulbright Program was in need of various technical and design solutions, ranging from updated page layouts and CMS upgrades to online application customization and new server plan implementations. Working with IIE exemplifies one of Timemaster's greatest strengths, make accurate assessments and implement appropriate solutions, all without missing a beat. As new requirements arise, IIE, as with all of our clients, can rest assured their online business needs will be met with the most cost and time-efficient solutions. The Fulbright Foreign Program online application organizes the complicated process of managing information from more than 155 countries worldwide with approximately 4,000 program participants each year.